Waylon Jones was born with a rare medical condition that caused his skin to become scaly and his appearance to develop progressively into that of a crocodile. Forced to wrestle alligators in a carnival, Waylon decided that if society declared him a freak, he would succumb to his savage nature and become Killer Croc. 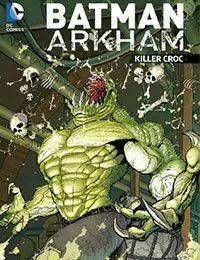 Known for his brutal strength and fearsome rage, Killer Croc has been one of Batmans most physically formidable foes. When facing Croc, the Dark Knight isnt just dealing with madness: hes fighting a creature who is more beast than man. But Killer Croc will stop at nothing to defeat (or consume) his prey!